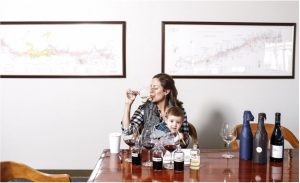 Winemaker Bibiana Gonzalez Rave with her son. Photo courtesy of the San Francisco Chronicle. 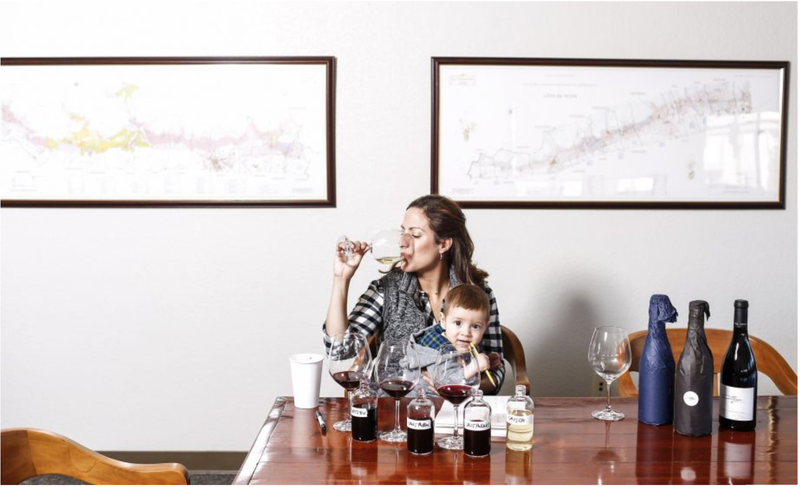 “The identity of a California winemaker has never been more complicated,” asserts the San Francisco Chronicle article crowning Shared Notes winemaker Bibiana González Rave 2015 winemaker of the year. The idea of estate winemaking has increasingly become just that—an idea—for an emerging generation of independent winemakers who hire out to those who can afford vineyard property, and who devote every spare minute outside these “day jobs” to building their own wine brands. From a pre-dawn jaunt to the Wayfarer Vineyard near Fort Ross to the Santa Rosa Shared Notes winemaking facility to a Napa Valley visit with the Pahlmeyer family, the article follows Bibiana as she criss-crosses Sonoma and Napa counties tending vines, tasting wines and applying her clear vision for what California wine should be. Her classical training in some legendary French vineyards carries through in her dedication to being both grape grower and winemaker. “She is so connected to the vineyard,” says Anne Moller-Racke, manager of the Donum vineyard that supplies grapes for Cattleya. “That’s something a lot of people say, but for Bibiana it’s really true.” She stands defiantly against winemaking fads as well, insisting that “rich, velvety wines can still be balanced.” Or rejecting the trend to pick fruit ever-earlier to create low-alcohol wines. Bibiana forges “her own independent path stylistically.” She claims this has everything to do with being Colombian. The Chronicle praises it as refreshingly and promisingly Californian.